“We respect the law. On top of that I am well educated that is why I am Dr Mugabe. THE First Lady, Grace Mugabe has vigorously denied any bad blood with Vice President Emmerson Mnangagwa, adding, she was a humble Zanu PF women’s league secretary who remained firmly under the VP’s authority. 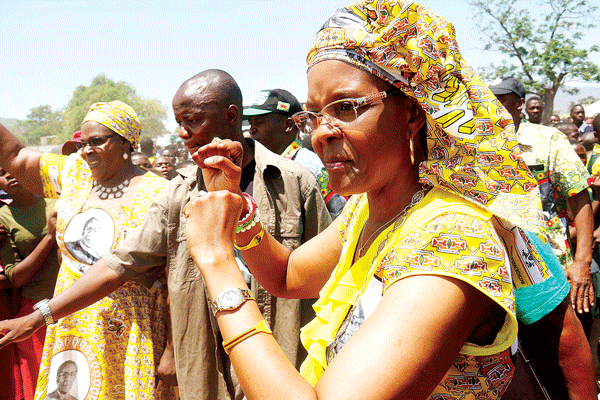 Grace told party supporters to her Midlands rally in Mberengwa Friday she will never try to usurp Mnangagwa’s powers. “Have you ever heard of me acting as President when the President is away?” she said, “Haa nonsense, hatidi kutaura zvinhu zvisina nebasa rese (Nonsense. Let us not be so petty)!” President Robert Mugabe’s wife is viewed as increasingly influential within both Zanu PF and government as she continues to ride on her powerful husband’s coattails. The local media has been awash with stories linking her to a plot to succeed her aging husband. The plot, it is said, is vigorously sponsored by a clique of young and ambitious politicians commonly referred to as the G40. Grace, in some of her public appearances, has been cosy with the group, which comprises cabinet ministers Jonathan Moyo, Saviour Kasukuwere and Patrick Zhuwao. But in probably her most candid comments over her relationship with Mnangagwa, Grace said she respected the country’s laws which are clear on the country’s leadership structure. VP Mnangagwa and wife Auxilia attended the rally, which was held at Mataga Growth point in Mberengwa. “Should Mugabe fall sick today,” Grace said, “the constitution is clear that this man (Mnangagwa) sitting here acts in his place. “There is nowhere written that because I am his wife who shares a bed and eats from the same plate with him, I must then take over. “We respect the law. On top of that I am well educated that is why I am Dr Mugabe. “I read and understand the Constitution. They want to reduce me to a dull person who knows nothing. I do not usurp any body’s powers.” In all her comments, Mnangagwa merely clapped hands and showed a sheepish smile. Justifies national rallies Grace said it was within her rights to tour provinces meeting “my family” as Zanu PF women’s league’s secretary. She said Mugabe and his two deputies were disciplined and hard workings leaders who should not be continuously distracted through endless tales of divisions within their party. “This man (Mnangagwa) you see here is very disciplined,” Grace said, occasionally referring to Mnangagwa as baba. She denied she was holding rallies in preparation of her what many view as her impending appointment as co-VP during the Zanu PF December conference. “We hold conferences every year to review how the party is progressing and if it still committed to its congress pledges,” she said. “Every five years, that is when leaders are elected. Ndiricorrect here baba (am I correct?” she said, directing her question to Mnangagwa, who nodded in agreement. She continued: “Hanzi correct nababa, ndapihwa hundred percent! “So before the 2018 elections, we go for our congress baba. That is when leaders are elected. For now, everyone keeps their position.” “Hatidi kuti tikanganise vamwe vanhu vakadzikama (Let us not mess up humble people).” President Mugabe’s wife said she remained a mere secretary for women’s affairs within Zanu PF’s packing order adding she was clear about her roles under Presidents Mugabe and his two deputies. “I simply discharge the duties they would have assigned me. I only have the privilege to sit at the front with them during politburo meetings. Otherwise I am way, way junior to them,” she said. Even after a well-received lecture about her being junior to Mnangagwa and co-VP Phelekezela Mphoko, Grace went on to dole out tractors and some agro-implements sourced by government to Zanu PF supporters during the rally.